Oxford Film Festival Take 5 With...: Take 5 with "The Beacon"
Take 5 with "The Beacon"
Meet Take 5 filmmaker, Abby Olivier, co-director of the short Mississippi documentary, "The Beacon." Olivier co-directed with Camilla Aiken. A: Our film features the Beacon diner in Oxford—its food, its southern traditions, and most importantly, its people. Any Oxford local who has been around for a while, or anyone who has the slightest interest in southern food and culture should watch this film for its witty and informative entertainment. A: The main takeaway from producing my first film is that the interactions I made with the Beacon folks not only greatly benefitted the film, but it made my experience humble and worthwhile. I absolutely cherish the workers and customers who I interviewed and with who I was able to spend so much time. A: I co-directed The Beacon with two other students for a Southern Studies documentary film course. It was my first time behind a camera, but not the first time to experience what The Beacon has to offer! 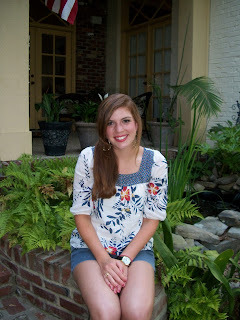 I am currently a senior at Ole Miss majoring in Public Policy Leadership with a minor in Southern Studies. I graduate in May. A: I hope that anyone who lives in Oxford or may be a constant or even sporadic visitor of the town can see this film so that the next time they eat at the Beacon it will be more than just a meal. A: Though I am currently not pursuing filmmaking, I love the art. If ever the opportunity arose to work full time in filmmaking, I would definitely consider it—especially documentary filmmaking.